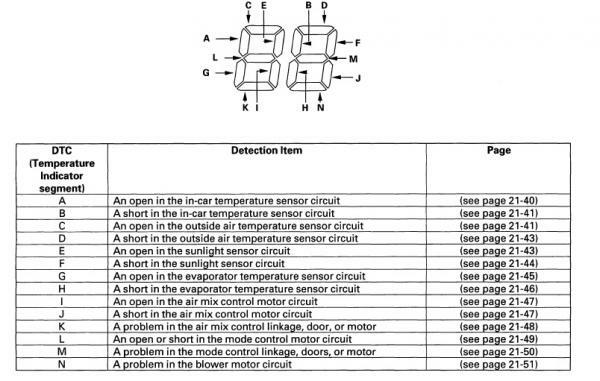 Here is how to get HVAC codes from the 98-02 Accords with climate control. I believe climate control was available on only the V6. 1. Turn the ignition switch to ON (II). You don't have to start the engine. 2. Set the temperature control dial on Max Cool, then slowly turn to Max Hot. 3. After 2 minute, press the AUTO button and then the OFF button. Continue to hold both buttons down. 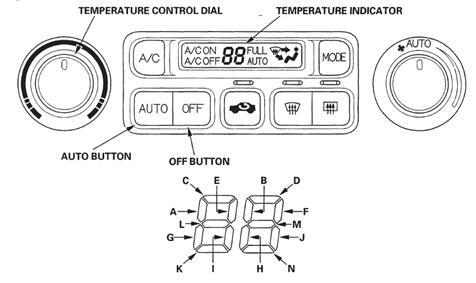 If there is any abnormality in the system when both buttons are pressed, the temperature indicator will light up the segment (A to N) corresponding to the error. The temperature indicator will then alternate every second between displaying "88" (all segments lit) and the error segment. If there is no abnormality, the segments will not light up. Turning the ignition switch off will cancel the self-diagnosis function. After completing the work, run the self diagnosis function again to make sure that there are no other malfunctions.